Acer presents a 17.3" multimedia notebook with the Aspire 7745G, which should apeal to gamers and film fanatics alike thanks to ATI's Mobility Radeon HD 5850 (DDR3-VRAM) and the integrated Blu-Ray-Drive. There are currently five model variations vying for customers' favor. 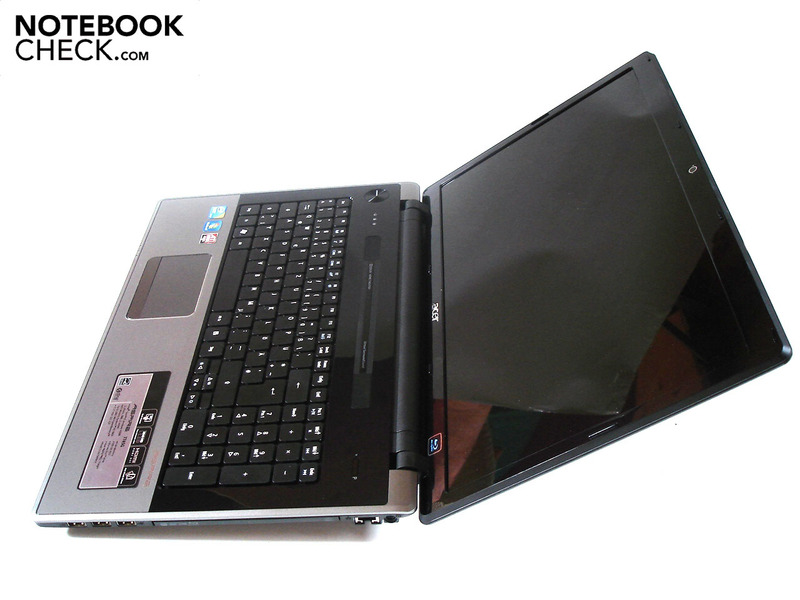 It started with the Aspire 7745G-434G50Bn which we tested at a to-have price of around 960 Euro and equipped with a two core processor (Intel Core i5-430M), four Gbyte DDR3-memory, a 500 GB harddrive and a graphic card from the upper mid-range (ATI Mobility Radeon HD 5850). Following that was the Aspire 7745G-724G50Bn situated at around 1000 Euro which though equipped with a strong Quadcore-CPU (Intel Core i7-720QM) nevertheless makes do with the somewhat weaker Radeon HD 5650. Four GB memory and a harddrive capacity of 500 GB correspond to the lower-priced model. For those looking to get a quad-core processor, a Radeon HD 5850 and a HDD encompassing 640 GB must shell out at least 1120 Euro and reach for the Aspire 7745G-724G64Bn. However, we would advise against going for the around 1170 Euro model, the Aspire 7745G-728G64Bn. Though it retains the Core i7-720QM and the 640GB of memory, the Radeon HD 5650 is put to service as its graphic card. The eight GB of memory don't matter there. Finishing off is the 1400 Euro top model Aspire 7745G-728G1.28TWn. At this price the buyer gets an impressive harddrive capacity of 1.28 TB (2x 640 GB) in addition to the Core i7-720QM, the Radeon HD 5850 and eight GB of memory. The various models resemble each other in the rest of the departments. The 64bit variant from Windows 7 Home Premium goes into service as the operating system. The 17.3" display has a resolution of 1600 X 900 pixels. A highlight is definitely the integrated Blu-Ray-Player (burns CDs and DVDs), which allows a top resolution for film viewing pleasure. For further specifications, refer to the data sheet in the right column. Visually, the Aspire 7745G reminds us a lot of the smaller Timeline X model (see our reviews of the Aspire 3820TG & 4820TG). The palm rest is made of brushed aluminum and is thanks to its matt silver surface relatively dirt resistant. 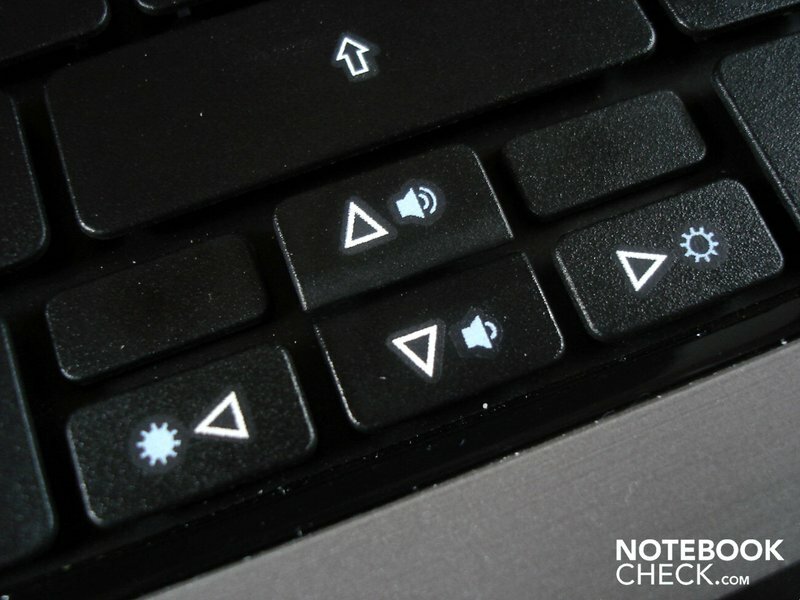 The exact opposite is the case for the black and high-gloss area around the keyboard. The plastic is susceptible to smudges and collects fingerprints almost magically. 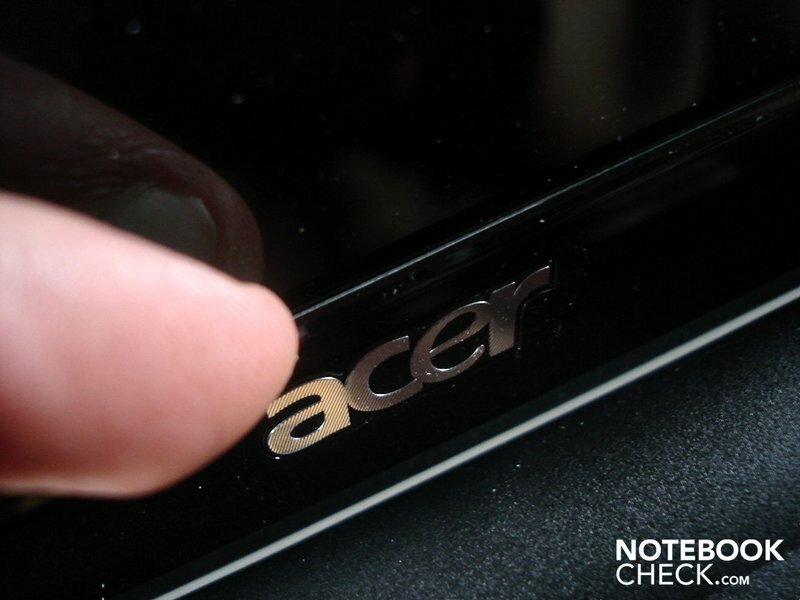 Unfortunately, Acer diverged from the Timeline X-Series in terms of the display lid, rather than going with brushed aluminum, they went with a plastic painted in high-gloss which is on the one hand extremely sensitive to smudges but does, on the other, have a nice lined texture. The Aspire 7745G didn't cut a particular good figure for itself in our stability tests. The area around the optical driver bends noticeably, even to light pressure. Still worse is the area around the hinges and display lid, which allow an alarming level of bending and twisting. The situation is not made any better by the fact that the hinges also cause the base unit to swing when opening the display. There is no room for criticism in terms of the finish and sharp edges and poorly worked parts are nowhere to be found. 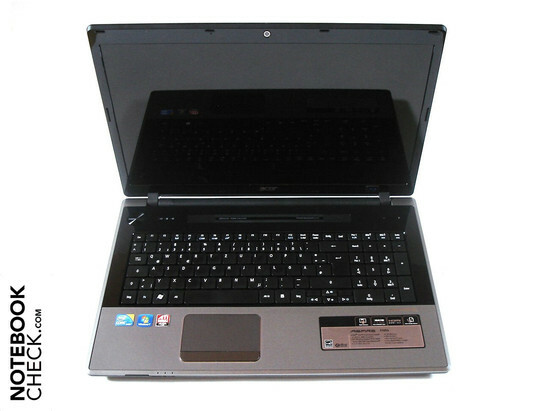 In terms of the dimensions, the Aspire 7745G is at 410 x 286 x 42mm (width x thickness x height) relatively run-of-the-mill and the weight of 3.19 kg is also in line with comparable notebooks. The Acer orients itself to its Timeline X-series not only in terms of its chassis, but also in terms of its array of connections. This unfortunately means that the user has to do without a plug-in for ExpressCards as well as connections for Firewire and eSATA. This is quite disappointing for a 17" notebook with multimedia aspirations. Other than that is the usual fare. 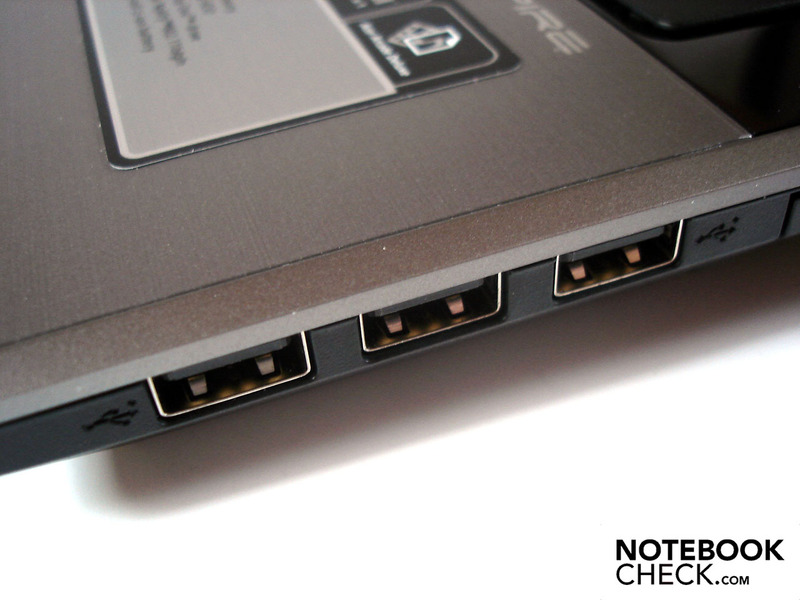 External monitors can be connected via VGA or HDMI; DVI and Displayport are missing as on most notebooks. 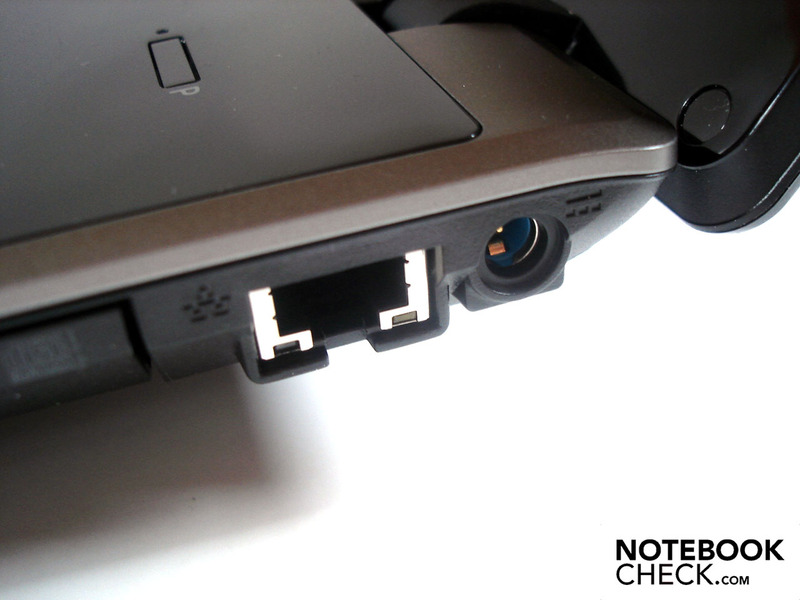 One can however hook up to a network over the RJ-45 Gigabit-Lan-connection or with the help of the integrated WLAN. Three sound connections guarantee connections with headsets or external loud speakers. Four (and in our opinion poorly placed) USB 2.0 ports and a Kensington Lock round it up. 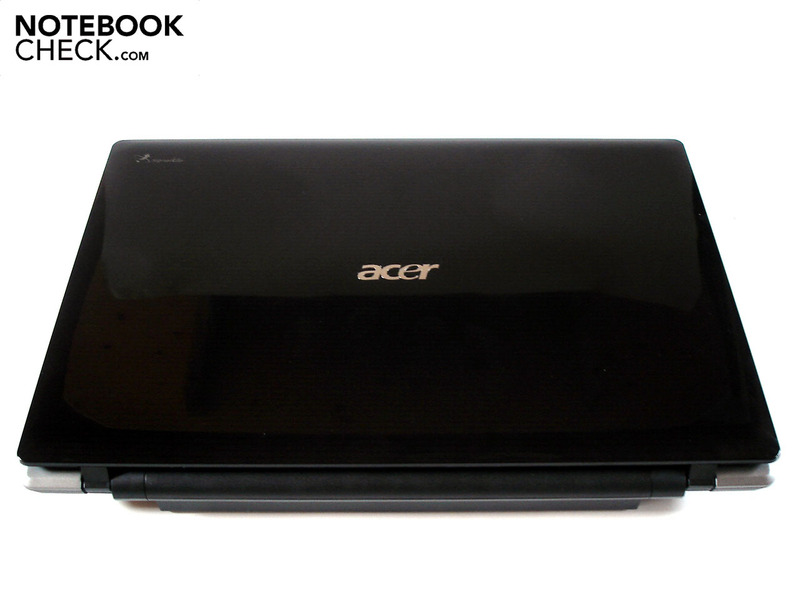 Acer wouldn't be Acer if it didn't bulk up the system of the Aspire 7745G with dozens of software features. A large part of those are quite unnecessary and needlessly slow the system (starting time, reaction speed). Only when the system is freed from all unneeded ballast does the notebook present itself in its potent form. We do want to highlight one feature of the software installation on the reader. "Acer Arcade Delux" is a practical multimedia application which scores well with its clear user interface and intuitive operation. 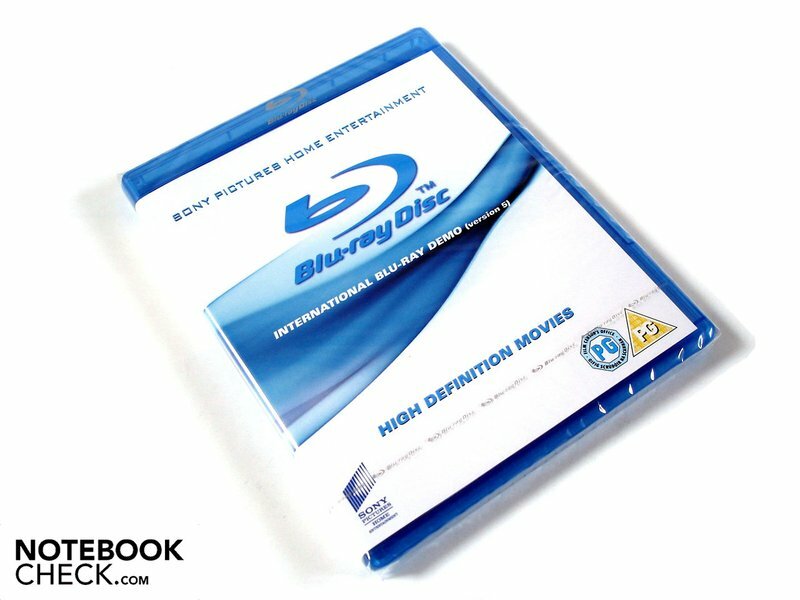 We were above all pleased with the ability to play Blu-Ray films directly and without expensive additional software. 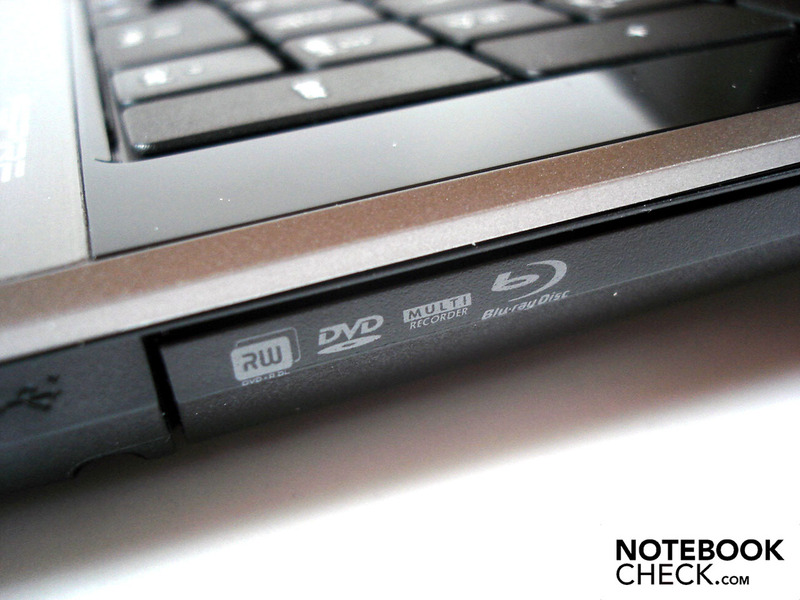 Anyone who doesn't already own a Blu-Ray-Disc can still familiarize themselves with its technicals aspects as Acer supplied the Aspire 7745G with a corresponding disc with numerous, high resolution trailers. 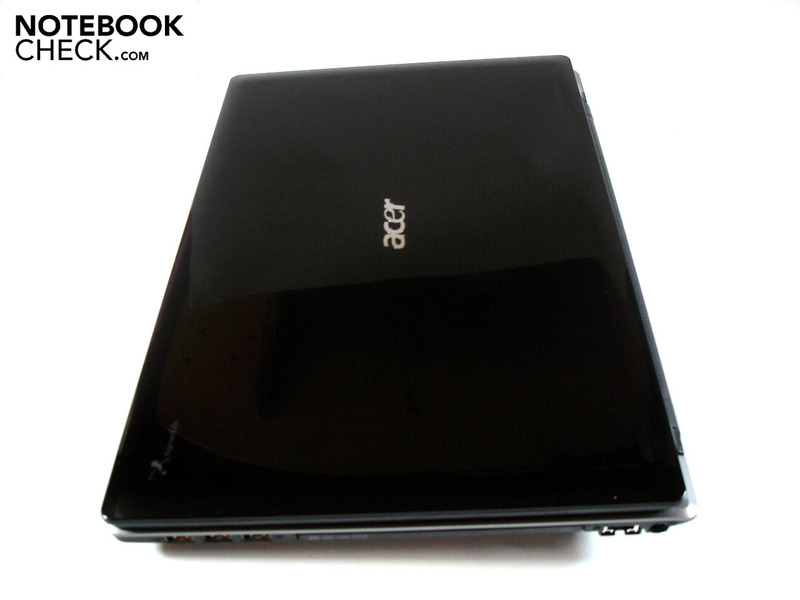 Acer did without a remote control such as what we recently found in the packaging of the larger Aspire 8943G. 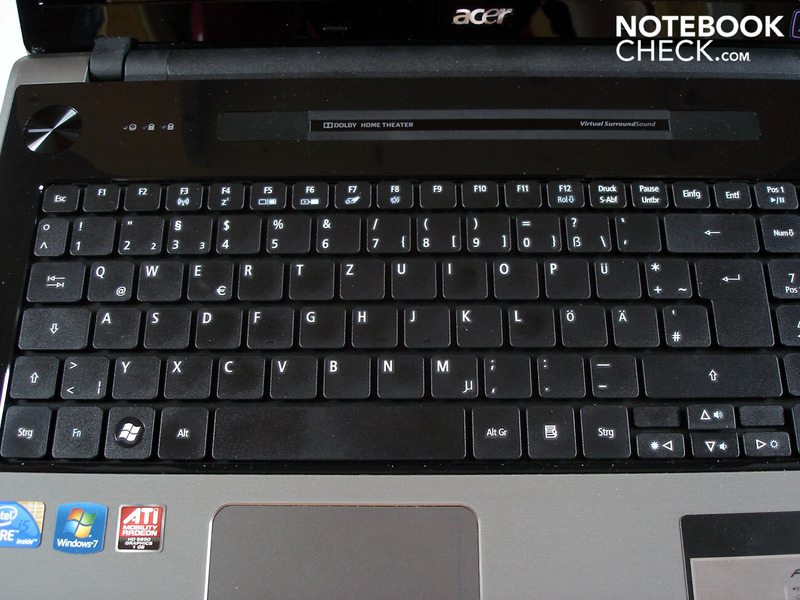 Acer didn't get the keyboard exactly right. For one thing it slacks noticeably on the right side. For another, the undefined pressure point of the keys as well as the spongy stroke leave a lot to be desired. On a more positive note we can mention the pleasant release sound and the impressive size of the keys. 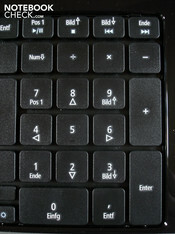 Only the left shift key and the arrow keys were made too thin. There is nothing to complain about the layout as Acer didn't wager to experiment in this respect. Unfortunately, anyone looking for an illuminated keyboard is out of luck here. 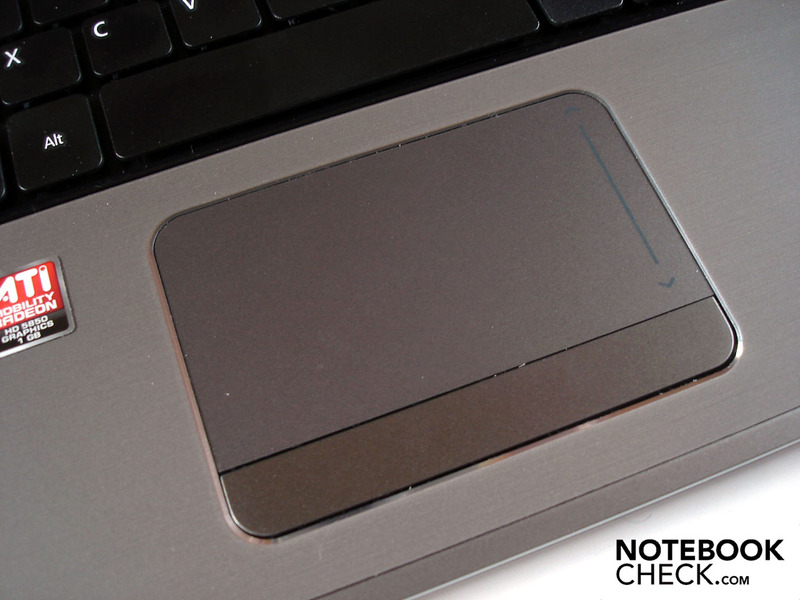 In contrast to the keyboard, the (multitouch capable) touchpad made a very good impression. The pleasing surface allows for outstanding gliding characteristics. The satisfying dimensioning, the well-sorted scroll function and the faultless precision make work easy. The slight depression gives the necessary size and orientation. 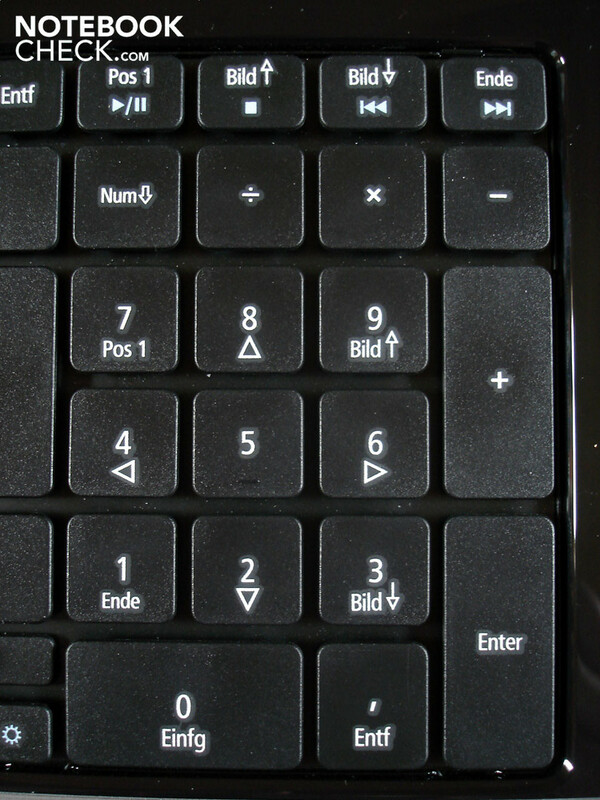 In order to prevent the touchpad from being unintentionally initiated while gaming, one should make use of the deactivation function as needed. Finally we come to the two mouse keys, which are joined in a single bracket and which work superbly in terms of their pressure points and acoustic. 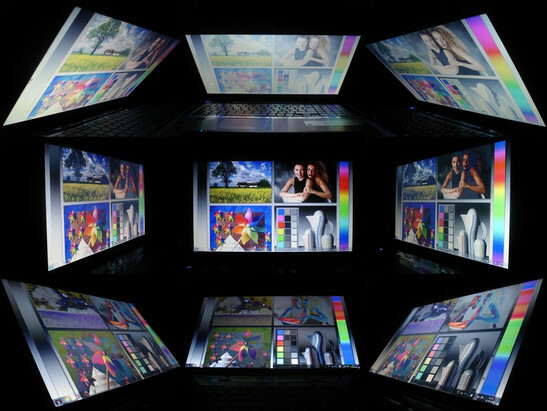 The 17.3" display with a screen diagonal of 43.94 cm has been kept in the 16:9 widescreen format and has a resolution of 1600 x 900 pixels. This allows for a good working space so that one can easily operate two windows next to each other. Though film fanatics would have been more pleased by a FullHD resolution of 1920 x 1080, the graphic card would have been overextended in newer gaming applications. 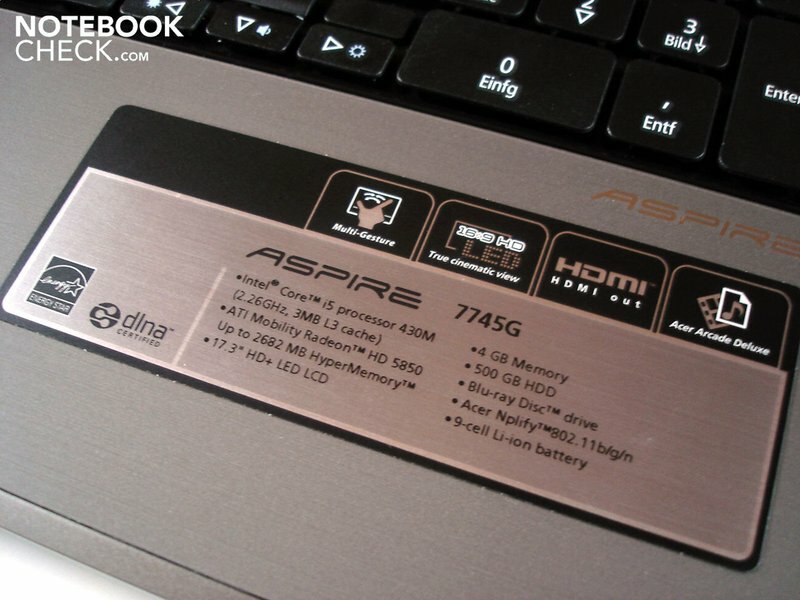 The Aspire 7745G shows several weaknesses when measuring its display values. It started with its black level which came out too high at 1.04 cd/m². Dark areas don't seem deep black, but rather light grey. The contrast at 196:1 is at best average, though it must be mentioned that many notebooks hardly measure up any better and that the reflective display can conceal this well, as colors make a relatively powerful impression. The illumination is also not optimal at 79%. The brightness shifts between 161.1 cd/m² (upper right) and 204 cd/m² (middle). Though subjectively, the user does not notice this. On average, a relatively good luminance of 188.8 cd/m² is given off, at least enough to handle a sufficiently bright picture. 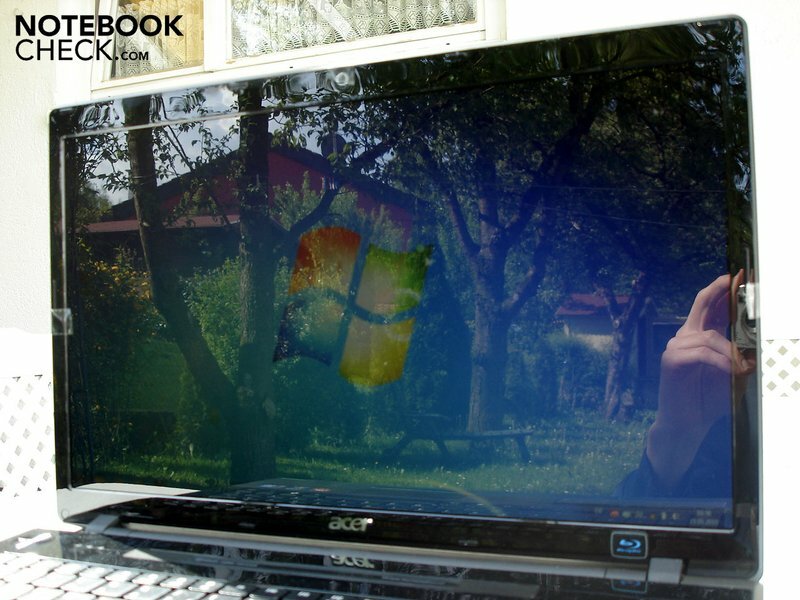 Because Acer does not employ an anti-glare surface, the screen is susceptible to strong reflections outdoors. Even inside, bothersome reflections can be seen when across from or underneath a window or light source and can detract from gaming or film viewing enjoyment. 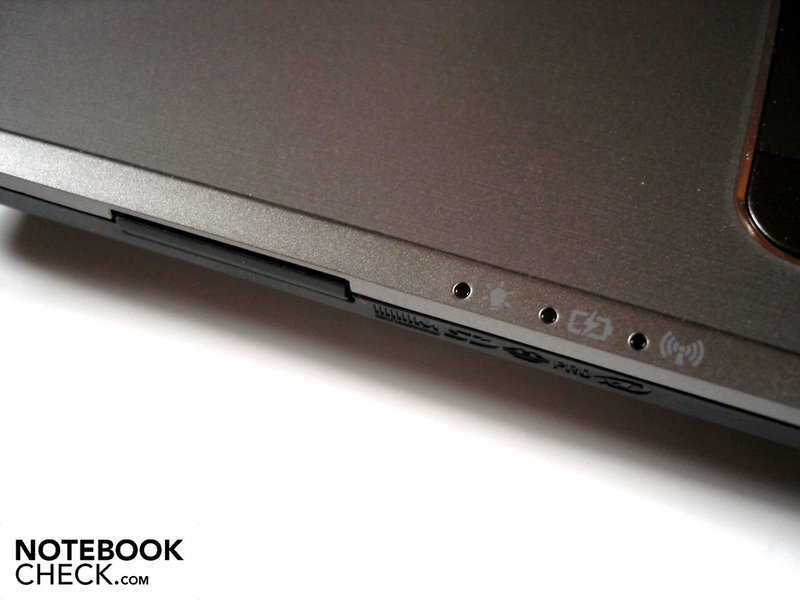 The biggest point of criticism on the Aspire 7745G are in our opinion the limited viewing angles. While the picture stays more or less stable horizontally, even minimal variations in its vertical position distort the brightness and color values. Regardless of how one positions the screen and regardless of how one turns the display: At least half of the display has an annoying, unsightly gray tinge. 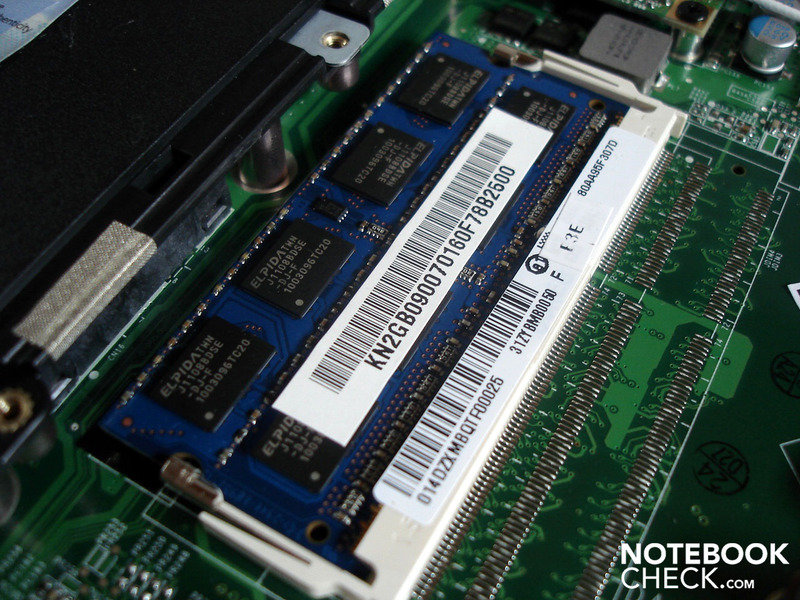 Processing duties are handled by Intel's Core i5-430M. The dual-core CPU clocks normally at a descent rate of 2.26 GHz. But using Turbo Boost Technology (automatic overclocking), the clocking rate can be raised up to 2.53 GHz as needed. Hyperthreading on the other hand works to simulate two additional CPU cores, whereby the Core i5-430M can process four threads simultaneously. When playing, Hyperthreading offers hardly any advantage, though optimized applications can profit significantly. A special feature of the Core i5 is the integrated graphic chip by the name of GMA HD, which in contrast to the CPU unit is finished in a 45 rather 32nm process. Based on the performance, the GMA HD doesn't have too much on the ball which is why gamers should definitely reach for notebooks with dedicated graphic cards. But back to the Core i5-430M, which in addition to 512 KB L2 cache has more than 3MB l3 cache. The energy consumption is above average at 35 watts; for comparisons sake, old Core 2 Duo CPUs like the P8600 (without the graphic unit) allow themselves 25 watts. For the graphic card, Acer went with the ATI Mobility Radeon HD 5850. 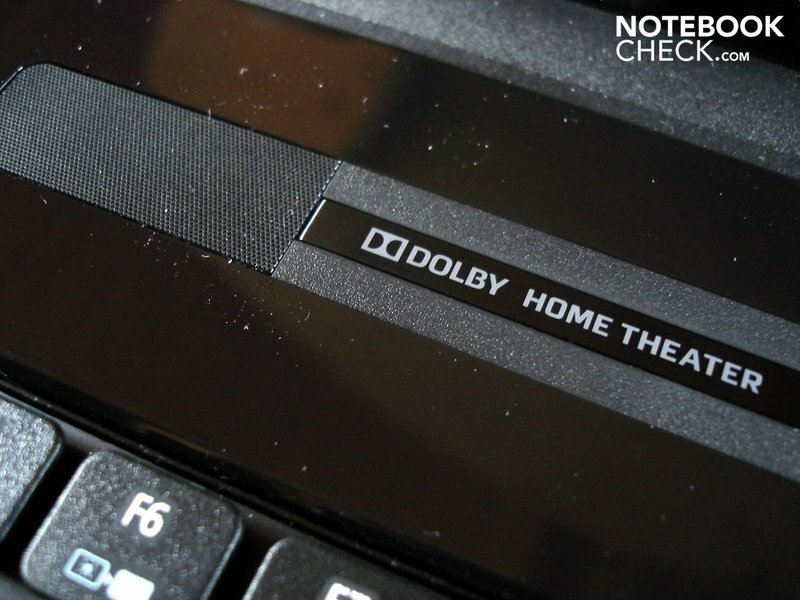 Like the top model HD 5870, the HD 5850 fall back on the -for notebook standards- lofty 800 Unified Shader. Another highlight is the support for DirectX 11 currently found only on ATIs in the mobile sector. The energy consumption of the GPU (produced in 40nm as per modern standards) is up to 39 watts which considering the performance offered can still be deemed as reasonable. 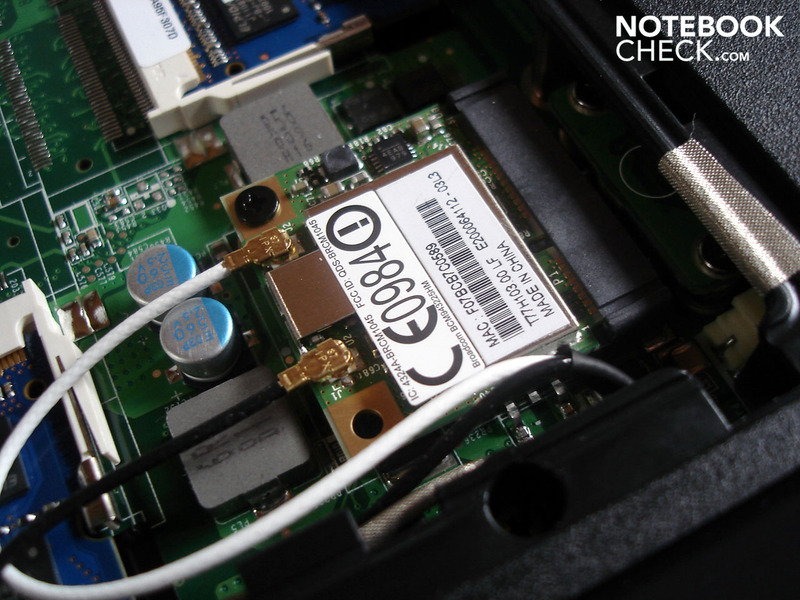 The core clocking goes to the maximum demands of the ATI with 625 MHz. 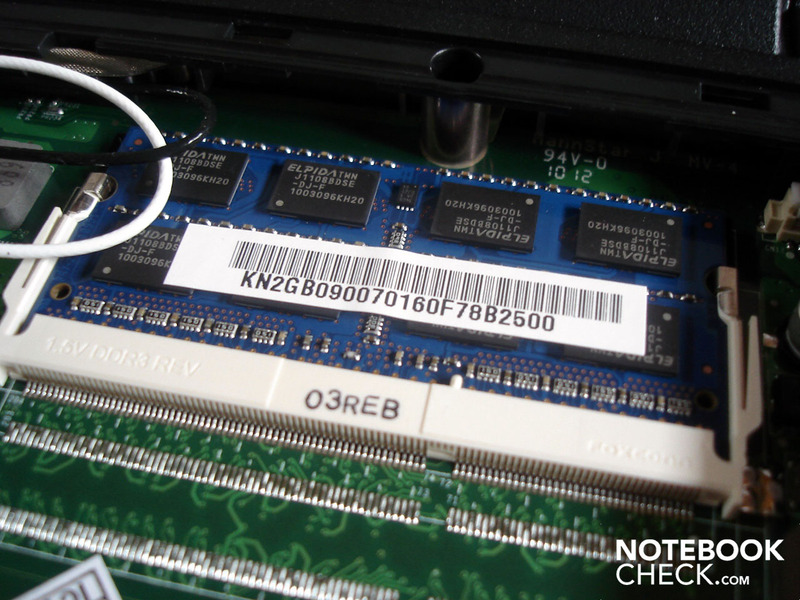 The 1024 MB memory on the other hand clocks with only 800 rather than 1000 MHz. Reason: Acer equipped the Radeon HD 5850 only with DDR3-VRAM. That wouldn't be a problem if the memory range of 128bit wasn't relatively small. This combination often leads to bottlenecks and allows significant breaks in performance at higher resolutions. Only with the snappy GDDR5-VRAM does the Radeon HD 5850 (see review of the MSI GX640) qualify as an unemcumbured, recommendable gamming graphic card. 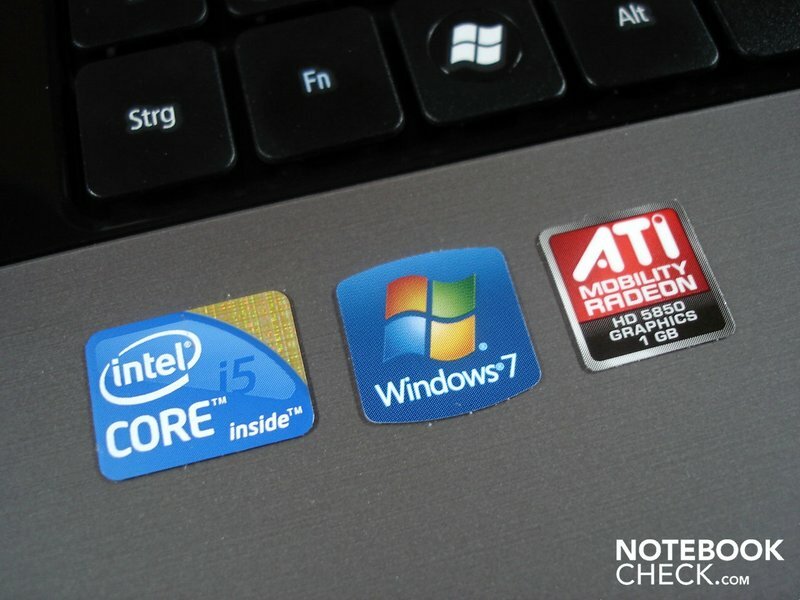 Nevertheless, there is hardly any higher performing fare in the price class under 1000 Euro; notebooks with GeForce GTX 260M start for instance at around 1200 Euro. But Acer does deserve praise for offering the option to switch between dedicated and integrated graphic units (switchable graphics). 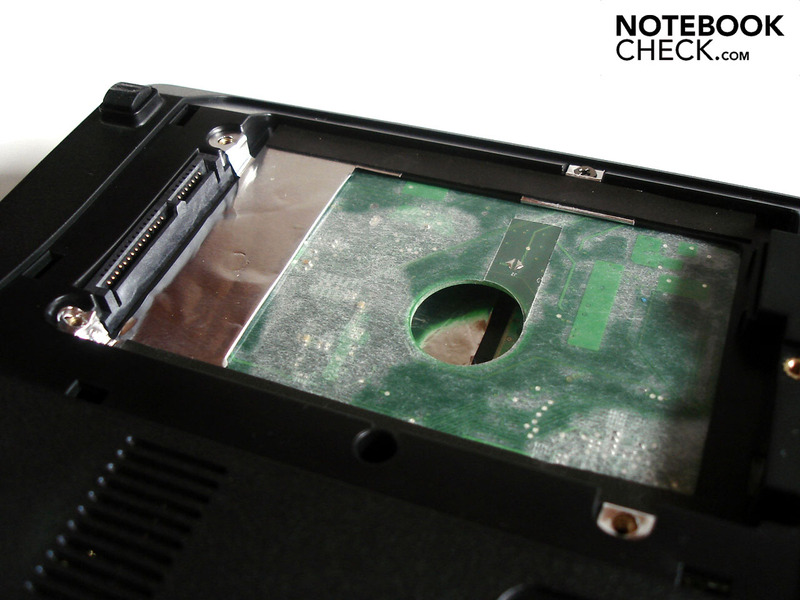 This technology is thankfully found more and more notebooks (ex. 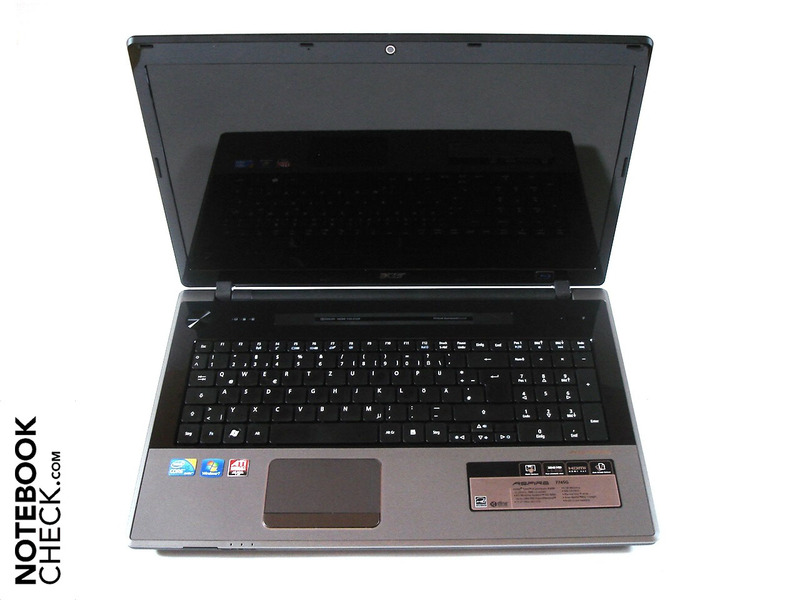 Acer Aspire 4820TG) and is extremely practical, as the user can focus on either performance or mobility depending on the application scenario. The procedure for switching also goes very easily (right click on desktop, configure switchable graphics) and only take a few seconds. Required is however that certain programs are closed beforehand. Nvidia's counterpart Optimus (ex. in the Asus N82JV) doesn't have to deal with these limitations as it can switch on the dedicated graphic card dynamically. The Optimus is however highly dependent on the driver and in the end both variants have their advantages and disadvantages. One more word about the Aspire 7745G: Our tester often switched the graphic unit without being asked despite being in deactivated PowerSmart Manager. The reason for that could not be determined. Time to turn to the application benchmarks. In Cinebench R10 (64bit), the Core i5-430M made a good impression. With 3396 points in single core rendering it feel just under Intel's beloved four core Core i7-720QM (4x 1.60 GHz) which comes up around 3700 points. The fastest two-corer currently, Intel's Core i7-620M (2x 2.66 GHz) can distance itself somewhat with ca. 4260 points. In mutli core rendering, the Core i7-720QM places itself, as expected, on top with 9889 points, whereby the Core i7-620M can still hold its own with 9033 points. The Core i5-430M is well beaten with 7881 points. Now we turn to the graphic testing benchmarks. In 3DMark 03, the Radeon HD 5850 achieved a good result with 24488 points. The then best-value tip, the Radeon HD 5650, gets 20354 points, the Radeon HD 5870 by comparison a significantly higher 38656 points. Differences shrink the 3DMark 06 and the Radeon HD 5850 with its 14501 points can more or less edge up on the Radeon HD 5870 (17932 points). Gaps again get larger in the 3DMark 06. While the Radeon HD 5850 stays under 10000 with 7885 points, the Radeon HD 5870 achieved a decidedly better 12634 points. In the 3DMark Vantage, the Radeon HD 5850 with its 4963 positions itself pretty much in the middle between the Radeon HD 5650 (3224 points) and the Radeon HD 5870 (7860 points). 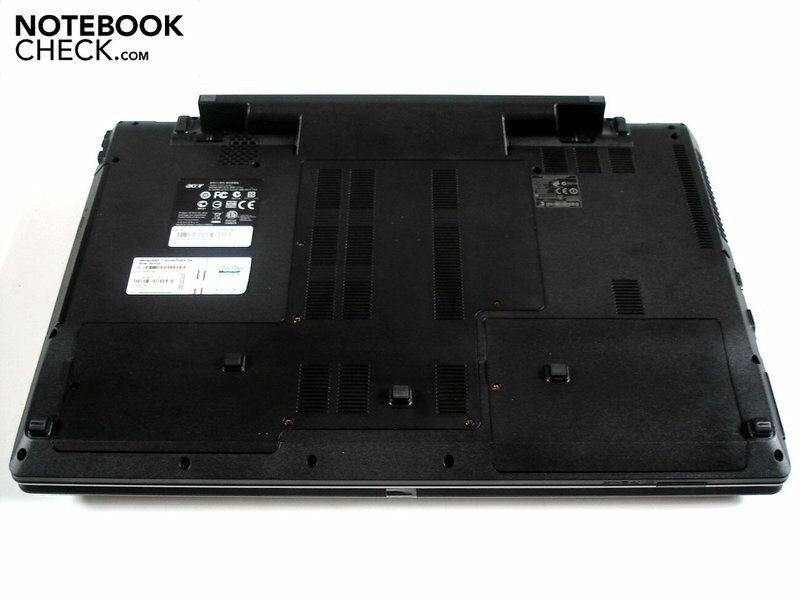 The case of the Aspire 7745G allows up to two harddrives to be housed within. The model in question is already equipped with a 500 GB HDD from Western Digital. This turns at 5400 r/m and delivers a descent transfer rate at 54.8 MB/sec. For comparison, good HDDs achieve at least 60 MB/sec. Intel's Core i5-430M gives good application performance and doesn't necessarily need to hide from higher clocking dual-core units. The Radeon HD 5850 also impresses, though by using a DDR3 video memory, it can only barely set itself apart from the theoretically significantly lower-performing Radeon HD 5650. It is in over its head against the Radeon HD 5870 and is mercilessly left out to dry. In order to deliver practical results, we carried out all the gaming benchmarks in the native resolution of 1600 x 900. Though Infinity Ward's Shooter often leaves something to be desired in terms of texture quality, the hardware demands aren't ideal in comparison to other games. Thus you can play Modern Warfare 2 even with very high details (all on) and 4x AA at an acceptable level: 39.6 fps was the result of our test. Aside from particularly demanding scenes (for instance with massive smoke development), the image refresh rate stayed consistently within the fluid range. The Aspire 7745G began to sweat more in Bad Company 2. With higher details, 2x AA and 4x AF, one is confronted with a very jerky gaming experience thanks to the 32.3 fps. If you deactivate antialiasing and reach for dual anisotrope filtering, the performance jumps up to a good 41.3 fps. In high detail mode and with 4x AF, the Radeon HD 5850 is capable of lighting up 28.1 pictures per second on the screen. As just around 30 fps is enough for a pleasant gaming feel in rollplaying games, nothing more stands in the way of a foray into the more or less freely accessible game world. Though the buildup strategy game admittedly profits significantly from 4 core CPUs, the Aspire 7745G can itself nonetheless sufficiently power Anno 1404 with very high graphics and 4x AF thanks to 37.4 fbs. Though the image refresh rate varied significantly depending on the level of zoom, Anno 1404 never fell to an unplayable level. The newest Need for Speed offshoot can't quite match the competition, Dirt 2, in terms of illumination. The developers have however done good work on the powerful sensation of speed. A further strength of the game is the relatively constant performance, which you can see in our graphs. With high details and 4x AA we got for example 31.5 fps, which is just enough to comfortably drift around curves. The atmospheric Ego-Shooter based on Dmitry Glukhovsky's (highly recommended) novel series shocks not only with the numerous moments of gruesomeness but also by its extreme waste of resources. You don't need to try out very high details and the DirectX 11 mode as Metro 2033 already heavily jerks with 19.3 fps in DirectX 10 mode and with high details (AAA, 4x AF). It looks much better at 32.0 fps in DirectX 9 mode and mid-level detail settings, though the performance topples again and again under the critical 25 fps in outside areas. Including the DirectX 11 effects, the Radeon HD 5850 gets swamped somewhat when set on high details and 4x AA. The on average 22.1 fps are not enough to make for an enjoyable experience with this Rally racing game. In high details and 2x AA, Dirt 2 can be played acceptably with 29.8 fps. There are no surprises to report on what is still the best looking game of all time. With high details, Crysis jerks and bounces; 20.8 fps in the CPU and 24.8 fps in the GPU benchmarks tell a clear story. In middle details, however, Crysis runs in a well-behaved manner with 42.5 fps in the CPU and 48.1 fps in the GPU benchmarks. A mix of middle and high details should still run fluidly. The bottom line is: The higher the resolution and quality setting, the more the Radeon HD 5850 suffers due to its DDR3-video memory as well as the thin 128bit connection. The native resolution of 1600 x 900 is around the maximum that should be tried on the Radeon HD 5850 DDR3. With this resolution, a great deal of current games can be played relatively fluidly in high and sometimes even very high detail settings. Only with very demanding titles like Crysis or Metro 2033 is one necessarily limited to the middle level for details. Those who would class themselves as average gamers may be thoroughly pleased with the Radeon HD 5850 DDR3. More demanding players, however, will rather reach straight for notebooks with more potent graphic cards (Radeon HD 5850 GDDR5, Radeon HD 5870, GeForce GTX 260M & Geforce GTX 280M/GTX 285M). 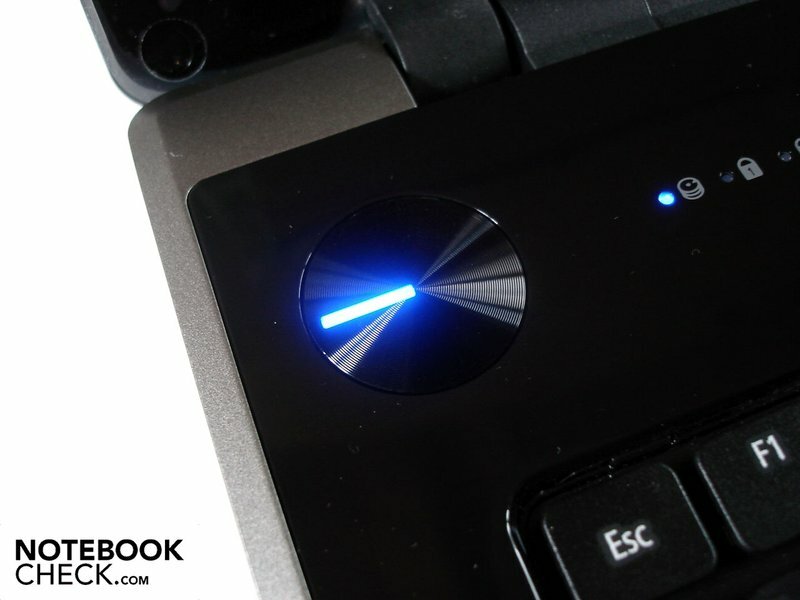 The Aspire 7745G comes off pretty well in terms of system noise. At idle, the case fan is only slightly audible with a constant level of 32.4 dB(A). 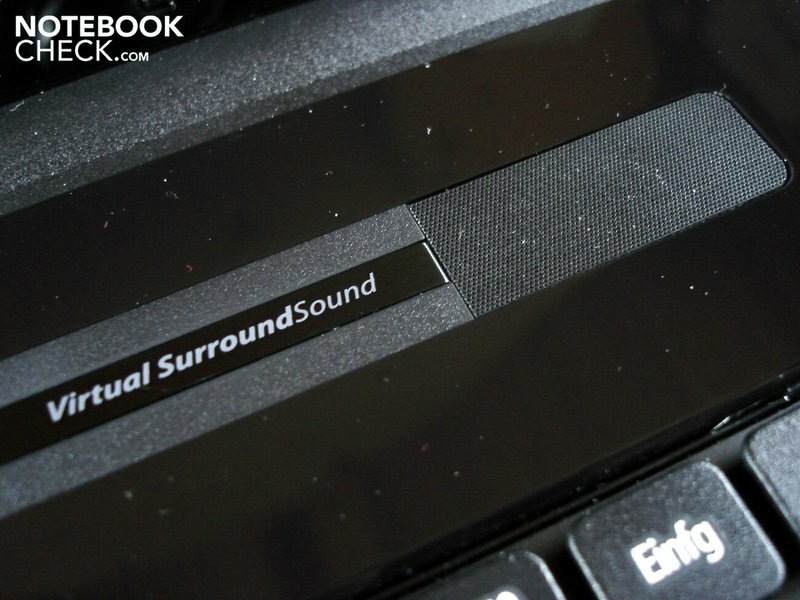 The user is luckily spared the constant and unpleasant changes in frequency which can be found on other notebooks (ex. Medion Akoya X7811). The harddrive makes itself more known with isolated clattering and a background noise of 33.7 db(A). The optical drive in the meantime goes to work with 35.6 dB(A) when using DVD/Blu-Ray, though one hardly notices this once a film has begun playing. The noise level only raises noticeably under load and the fan spins with a significantly more audible, though not necessarily bothersome, 37.0-40.2 dB(A). Unfortunately, there is a point of criticism from an unusual place. That would be the power pack on our tester which made itself known after a while with annoying whistling noises. Whether this is an isolated case or a general quality related production problem is hard to determine. 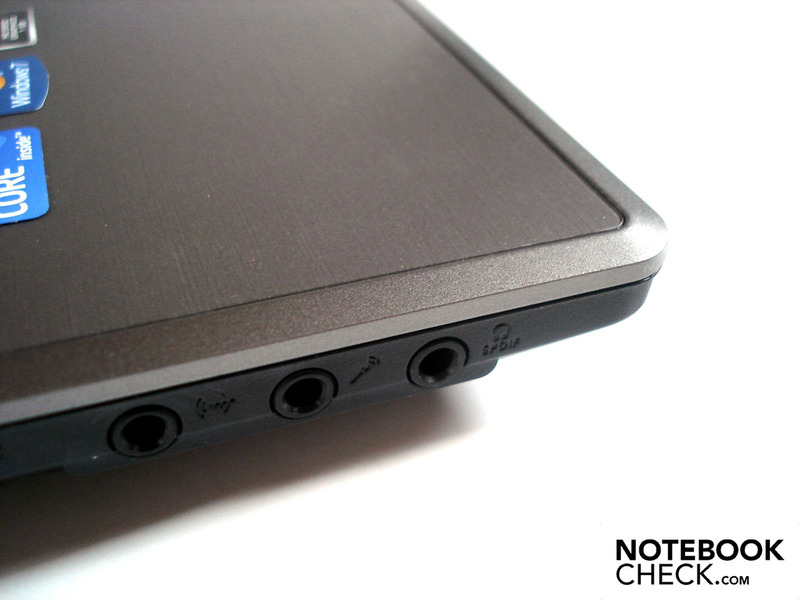 The Aspire 7745G not only impresses in terms of system noise, but also in terms of temperature management. 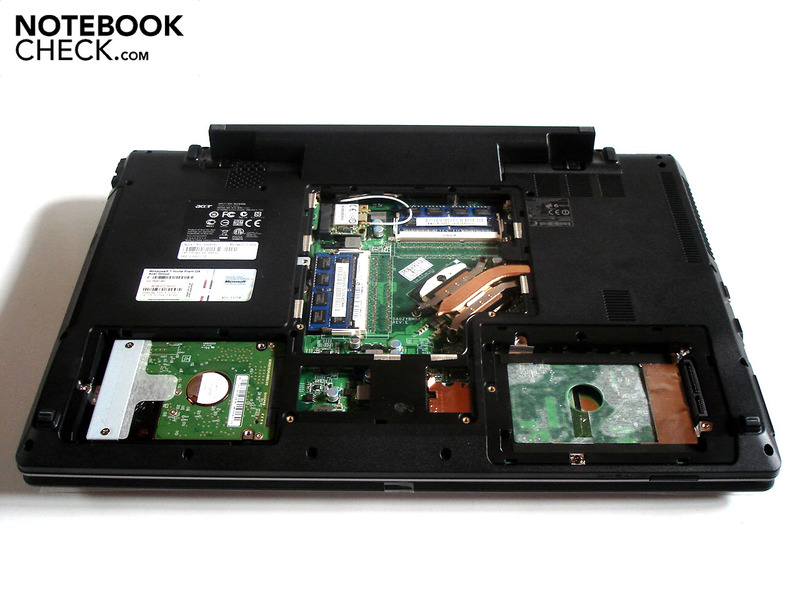 We have hardly ever seen these kinds of cool components on a multimedia/gaming notebook. 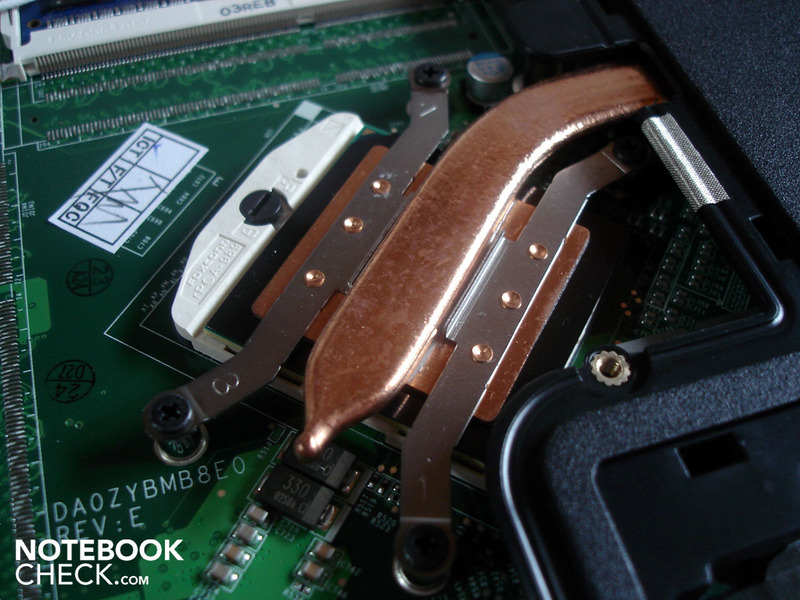 While the components of other systems near or even exceed the 100°C mark (see for example MSI GX640), the CPU (max. 68°C) and GPU (max 71°C) only marginally heated up in several hours of testing (full load with Furmark & Prime). The graphic card in the meantime stayed around 40°C, while the processor on the other hand stayed very cool at ca. 28°C. The case's surface could hold up at least at idle as both the upper and undersides were well tempered and didn't exceed the 30°C mark. The upper surface heats up significantly under load. The keyboard got up to 40.5°C in some places while the palm by comparison were up to 35.4°C. Sensitive natures could find these kind of temperature quite uncomfortable after a while. While the large Aspire 8943G scores well thanks to its good 5.1 sound system with an above average sound quality, the Aspire 7745G comes out with the fairish stereo loud speakers of the TimelineX series, which Acer did at least upgrade with a small subwoofer on the case's base. The resulting 2.1 system falls in the (so-so) range of comparable notebooks. And with that come the usual phenomena typical to notebooks of the day: The bass is only available to an extent, every tone level sounds slightly brassy, voices seem rather hallow and muffled and when worked too hard, bothersome noises crop up. The sound quality may be okay for one or two trips, but for stationary duty, one should not overlook the possibility of employing external loudspeakers. Another tip: definitely deactivate the Surround option by way of the loudspeaker settings under "Dolby", as this, at least subjectively, seems to make the sound worse rather than better. 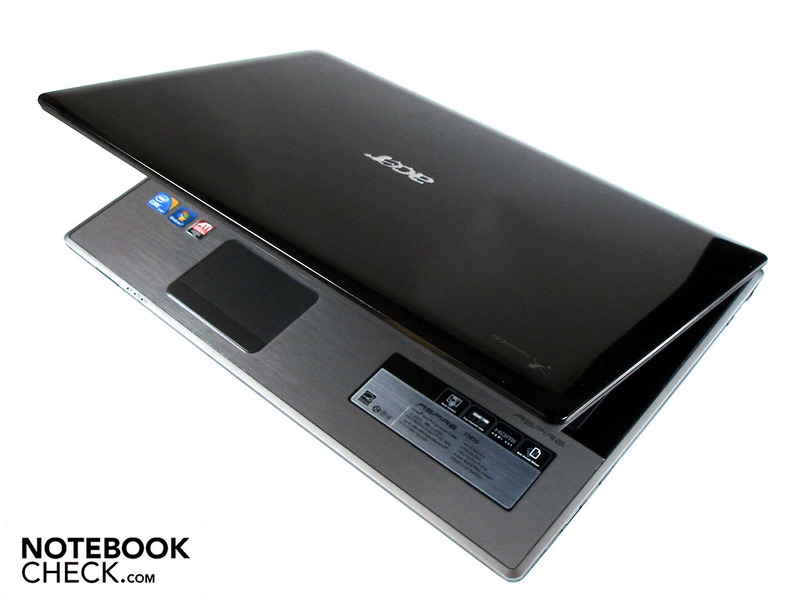 Acer equipped the Aspire 7745G with an immensely voluminous, and with 99 Wh also very powerful 9 cell battery. 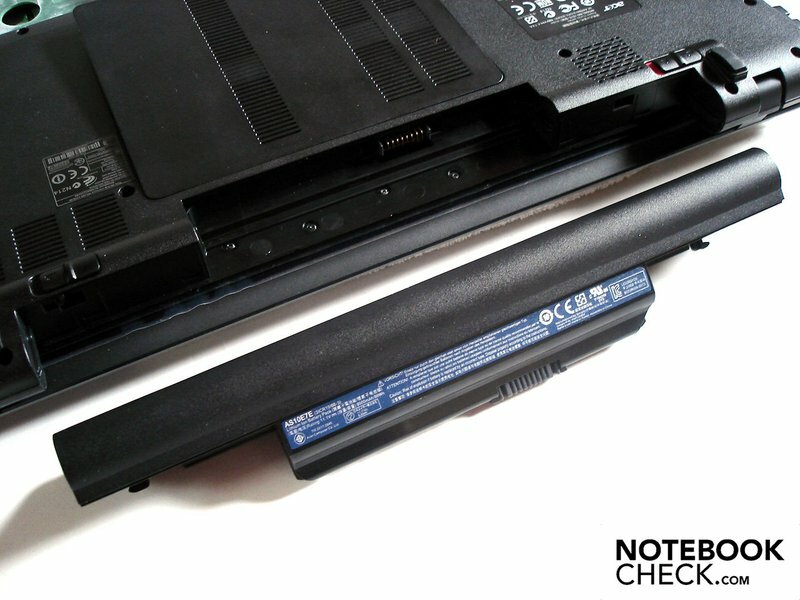 As soon as the battery is set in the case, the notebook elevated around 1.5 cm at the back, which on the one hand improves the air stream for cooling and on the other helps the ergonomics of the working area by tilting the keyboard slightly. 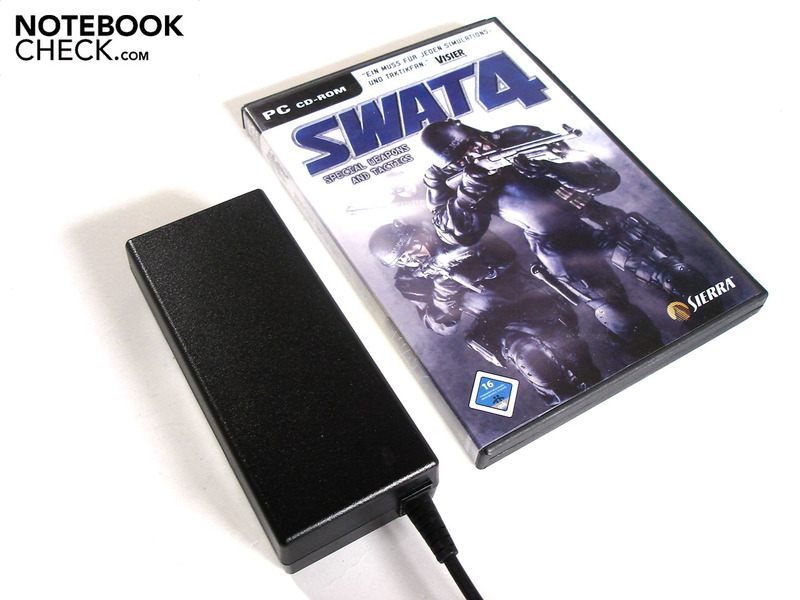 Together with the adjustable graphic card, the battery life inspires, especially at idle. We recorded an enormous 11 hours and 19 minutes on minimal brightness and with the maximum energy saving option in the Readers Test from Battery Eater. While the battery life drops rapidly once the brightness is turned up to its max, internet surfing via the integrated Wlan was still possible for a good 4 hours and 42 min. on moderate energy saving settings. The battery life hovered meanwhile around three hours when using FullHD-Blu-Ray and thus most films can be enjoyed without problem. Only when the dedicated graphic card is activated and the notebook goes up again a loading test (Classic Test from Battery Eater) does the battery life diminish to under two hours on deactivated energy saving settings. At least idle, the 17 incher shows itself to be relatively conservative in terms of current consumption with 12.8-18.1 watts. The current consumption rises under load to a still acceptable 57.8-84.6 watts. For comparison: many gaming notebooks readily consume double that. The Acer can't really be described as a potent gaming platform or desktop replacement, but the 17 incher cuts an overall fine figure as a multimedia notebook. 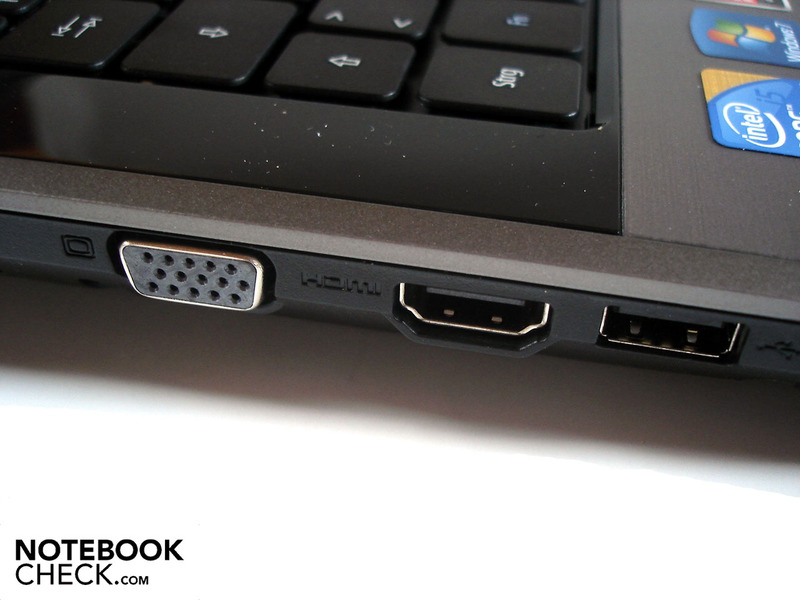 While the connection options leave a bit to be desired (no ExpressCard, Firewire & eSATA), the integrated Blu-Ray driver guarantees high resolution movie pleasure. The application and gaming performance is more than okay considering the price of 960 Euro, whereby the Radeon HD 5850 forfeits quite a bit of speed by doing without the quick GDDR5 video memory. Further advantages are the good touchpad and the option of switching between integrated and dedicated graphic units, which in combination with the powerful battery ensure a surprisingly high battery life. The keyboard meanwhile impressed us far less as it was susceptible to flexing and plagued by relatively vague pressure points. The chic case is also not free of drawbacks. 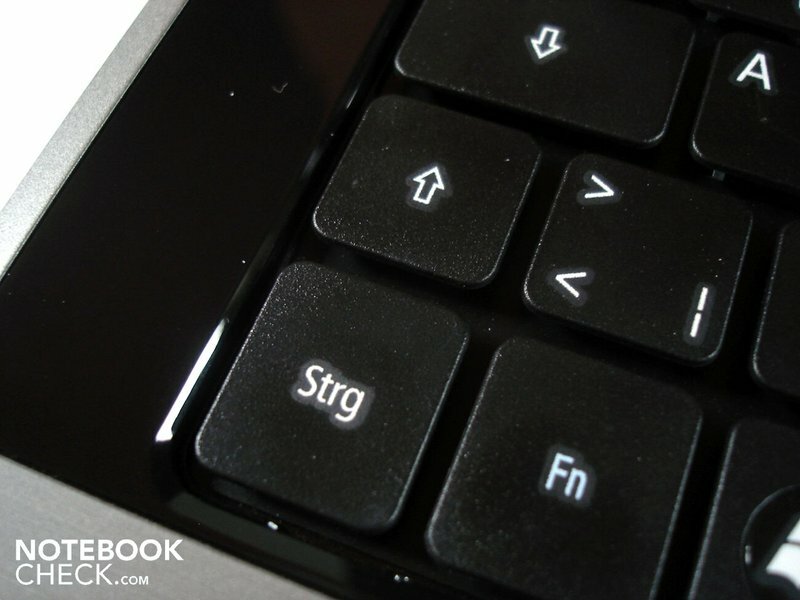 For one thing, the high gloss surface is very sensitive to dirt and for another, the notebook's lid especially proved to be very unstable. The main point of criticism is, however, the mediocre display. Be it the viewing angle, black level or contrast: Just about every aspect could be improved. 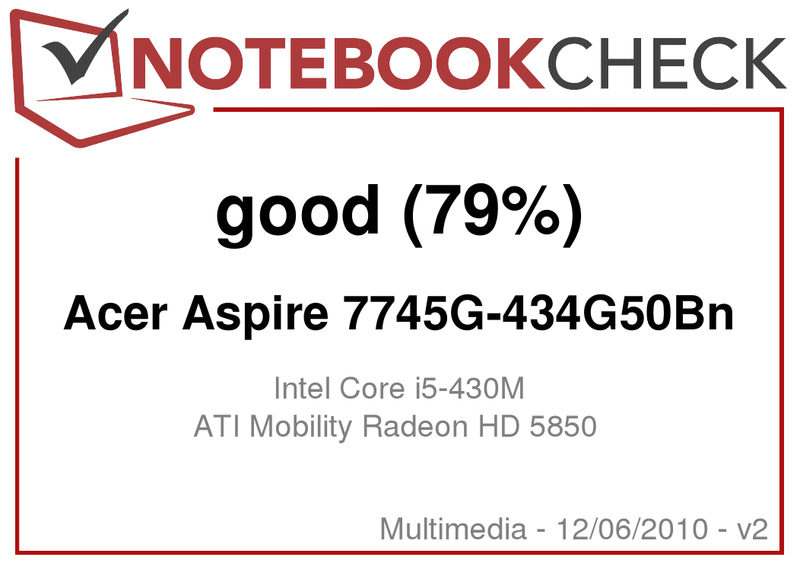 Or to sum up the review in a single sentence: If you can live with the mediocre display, the Acer Aspire 7745G is an all around good multimedia notebook at a fair price. The displays lid has a fine lined texture. Two shrouds can be removed from the case's base. The switchable graphics allow for a good compromise between battery life and performance. A better display: The viewing angles are highly limited, the black value is too high and the contrast too low.